When the rumor mill started to turn that Phish was going to opt out of a traditional Summer Tour and play 13 nights at Madison Square Garden there was a lot of confusion among the Phish community. Half of the fun during Summer Tour is the traveling and seeing new cities. There’s an indescribable feeling being reunited with friends that you only see once or twice a year on the road in a new city that you’ve never been to before. For Phish fans, MSG is like a second home. In the 3.0 era Phish has played five different New Year’s runs (to date) at the famed venue, as well as a few one-off shows in 2009. 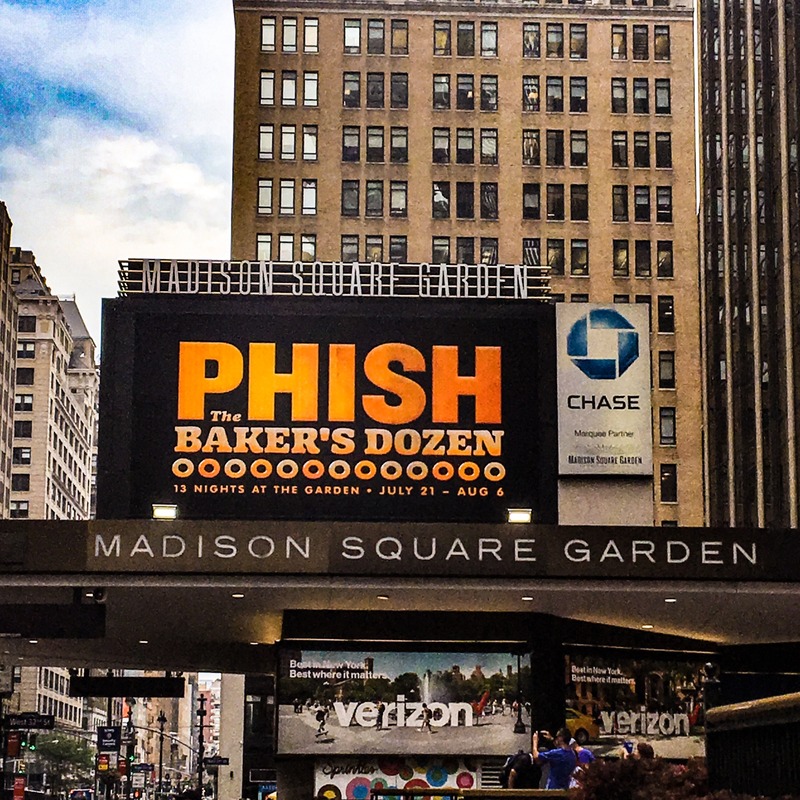 After the Baker’s Dozen run, Phish has now played 52 shows at the Garden. The Vermont quartet has toyed with the idea of this exact residency for some time. In a 2007 interview with Relix, Page McConnell spoke about the desire to do a residency with some usual Phish humor added to the twist. In a portion of the interview, Page says “another idea had them playing a “baker’s dozen” of shows – 13 nights in Madison Square Garden, say, or, adding another layer of classic Phish humor to it all, the Providence Civic Center, rebranded by corporate interests as the Dunkin Donuts Center. Riffing on that absurdity, the band imagined giving away free donuts and even basing the theme for each show around that night’s variety. For ‘Boston Crème,’ a setlist might have included covers of songs by Boston and Cream.” The idea was eventually scrapped by their management at the time. Fast forward to present day and the residency not only came to fruition but so did the Phish humor to coincide with it. Phish partnered with Federal Doughnuts to release a special flavored doughnut for fans before each show, just like they originally wanted to. With flavors like strawberry, lemon, cinnamon and more, Phish used this opportunity to craft their setlists each night to fit the theme of the flavor du jour. All of a sudden a plethora of new covers were introduced over the run and old songs were taken off the shelf in an act of liberation. Over the course of the 13 nights, Phish never had an off night. Each Phish concert is a unique experience but that doesn’t always mean they’re great expereinces. The Baker’s Dozen run was one great experience broken down by 13 incredible shows and Phish never let off the gas all the way through the encore of their final night. Phish played 237 different songs, 176 which were originals and 61 that were covers without repeating a single song. Over the course of the 26 sets they played the band found plenty of room to include their usual theatrics into the shows as well. The ever so rare “Harpua” featured a scripted dialogue from the band about how the universe is full of holes and shaped like a doughnut just to give you a taste. Not only did Phish construct well thought out setlists each night, without repeats, but they managed to do what they’ve always done best: improvise. For example, set two on their final night of the run contained only five songs but clocked in at just under 70 minutes long. Many original songs were stretched far beyond their normal bounds of casual improvisation over the course of the residency. Jamming past the 20 minute mark became the new norm during the run and it’s safe to say fans absolutely loved it. There hasn’t been this much overall fan approval of something Phish has done since the Island Tour, Big Cypress or Halloween in 2014. Currently, the band has dates scheduled in Colorado for their annual Labor Day weekend run and has no other plans to tour in the Fall. As New Year’s rumors start to turn, fans can’t help but to wonder if the band will retreat South to Miami (as they’ve done in 2009 and 2014) or if they will go right back to MSG and continue making history. The Baker’s Dozen run was nothing short of legendary and as we revel in the countless moments of brilliance over the run, it can still be said that the best is yet to come.